Emporia is the perfect location to host your meeting. We are conveniently located between Kansas City, Wichita and Topeka. Interstate 35, the Kansas Turnpike (Interstate 335), State Highway 50, and State Highway 99 all run through town. It’s the perfect spot for a meeting, company retreat, management training, leadership workshop or whatever you are planning. Locations accommodating small intimate groups right on up to 1,000 people are available at affordable prices. From Red Rocks, the historic home of famed journalist and Pulitzer prize winner William Allen White (50), to the modern facility of the Clint Bowyer Community Building donated by hometown NASCAR Sprint Cup driver Clint Bowyer (300), to the intricate Spanish Revival detail of the historic Granada Theatre (800), to the completely renovated Memorial Union (1000) at Emporia State University, we have the location you are looking for. 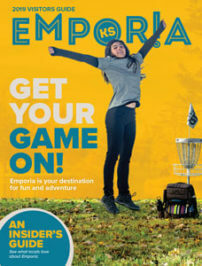 And after your meeting is over, Emporia has some great activities for you to indulge in. Home-grown shopping, dining, and nightlife is plentiful in Emporia as we are home to some of the best entrepreneurs around. For a unique chic boutique shopping experience try Studio 50•4 or Prairie and Pearls. Thirsty for a craft beer brewed on site (in the middle of the dining room!)? Visit Radius Brewing Company and while you’re there try their artisan-style appetizers, wood-fired brick-oven pizza and rotating Chef’s menu (after 5pm). Then head on over to Mulready’s Pub and indulge in their extensive variety of scotches, whiskeys, bourbons and craft beers or shoot a game of pool and listen to some live music at Bourbon Cowboy.